LIMA, Peru (CNS) — For days, the desperate mother had hovered around the ward called Santa Rosa, the infectious disease wing at the huge, teeming Dos de Mayo public hospital in downtown Lima. Finally, she saw her chance. That was more than a decade ago, before antiretroviral drugs had arrived in Peru, when HIV was a medical diagnosis, a moral judgment and — almost always — a death sentence. When women fought for their children’s lives. “The mothers are the real heroes in this,” Father Fedora said. Santa Rosa still houses patients with HIV — and often with other diseases, such as tuberculosis, to which they are especially susceptible — but times have changed. When Father Fedora visits now, moving quietly from bedside to bedside, he carries a message of encouragement and hope. When he arrives, doctors and nurses greet him, and most consider him part of the health care team, although that was not always the case. Acceptance of pastoral ministry in Santa Rosa came gradually, along with changes in attitudes toward HIV and AIDS. They are changes that Father Fedora, a U.S. priest, has lived through twice — in Los Angeles two decades ago, and more recently in Lima. “I’ve learned that the people on the margin, people who have been discriminated against, people suffering not only from physical (problems) but from poverty and mental ailments have a lot to teach us. I’m learning what it means to survive, to have perseverance, to have faith in the face of crisis.” — Maryknoll Father Joe Fedora. In the early 1990s, while promoting Maryknoll’s missionary work among Catholics in California, Father Fedora became chaplain to AIDS Project Los Angeles, one of the city’s largest AIDS support organizations. “It was during the worst period of deaths,” he said, although that gradually changed as antiretroviral drugs became available. Returning to Peru in 1998, Father Fedora felt as though he had stepped back in time. Antiretrovirals were not available, the country’s public health system was poorly equipped to deal with people with HIV or AIDS, and even the health professionals who worked with those patients suffered discrimination. Instead of returning to the rural parish in southern Peru where he had ministered among Aymara Indians as a young missionary priest in the 1980s, Father Fedora opted to work in Lima, the country’s sprawling and chaotic capital, where he could draw on his experience in Los Angeles. 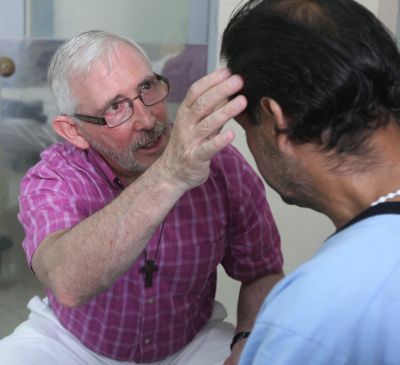 He joined a small but tenacious handful of priests and religious who were working among people with HIV and AIDS in Lima. Those worst affected were poor, often rejected even by their families, suffering from an illness that was feared and little understood. Father Fedora organized retreats for patients and their families, met with a prayer group started by transvestites in what is still one of the city’s poorest and roughest neighborhoods, and visited the public hospital wards, where a sister who was also a nurse had blazed the pastoral ministry trail. Although doctors initially were reluctant to accept pastoral ministers, “we realized that their work made our work more successful,” recalled infectious disease specialist Eduardo Ticona as he made morning rounds in the Santa Rosa ward. Father Fedora also brought new information to the medical teams after attending international AIDS conferences, Ticona said. And with it came hope, as word about antiretrovirals spread. An international program, the Global Fund to Fight AIDS, Tuberculosis and Malaria, began offering antiretroviral drugs to poor countries, but first “the country had to recognize that there was a problem and that it needed help,” Father Fedora said. Peru needed prodding, so pastoral ministry led to protest. Nonprofit advocacy organizations and support groups of people with HIV or AIDS staged demonstrations and lobbied government officials and members of Congress. “Padre Jose was right out there with us,” said Paul Figueroa, who was diagnosed in those early years and who still stops by Santa Rosa to help out as a volunteer from time to time. Hope, in the form of antiretrovirals, finally arrived in 2002, first for children and pregnant women, and finally for all patients. The five-year Global Fund program ended, and the government Health Ministry now provides the medications. But activists must remain alert, Father Fedora said. “We have to make sure that every successive government has the political will to come up with a budget (for the drugs) every year, and it has to reflect the increase in the number of people” receiving treatment for HIV, he said. Stigma remains an issue. Patients usually arrive at Santa Rosa when they are very sick, often with tuberculosis, because they fear the discrimination that comes with a positive diagnosis, Father Fedora said. And although the ward is now a way station toward health, rather than a final step on the journey, “What I want to see are empty beds, and I’m not seeing empty beds yet,” he said. 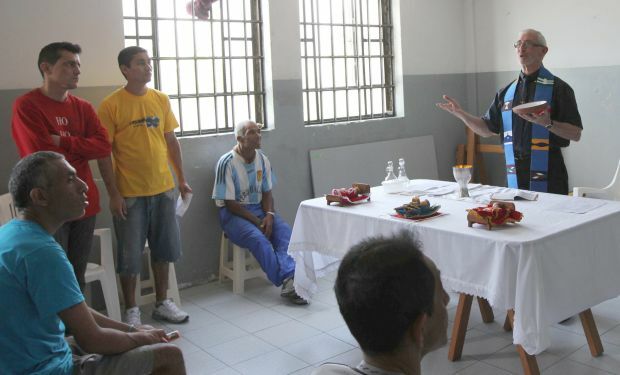 Nor are there empty beds in the infirmary in Lima’s huge and overcrowded San Pedro Prison, at the base of a dusty hill on the city’s east side, where Father Fedora celebrates Mass and shares a meal with inmates twice a month. Built for about 1,700 inmates but housing more than four times that many, the prison operates like a small city, complete with extortion, moonshine, drugs and a constant undercurrent of violence. Prisoners move about freely during the day, far outnumbering the guards. The two dozen HIV-positive prisoners who have chosen to live in the infirmary have less freedom — they cannot mingle with other prisoners, but they are protected from the violence and the temptation of drugs, which would complicate their treatment. During Mass in a low-ceilinged recreation room painted in two-tone gray, the prisoners pray for their families, their health and freedom. A few receive Communion, but many line up afterward for the sacrament of the sick, bowing their heads as Father Fedora anoints their hands. This is ministry on the “periphery” of which Pope Francis speaks, he said. And as he moves from bed to bed in Santa Rosa or chats with prisoners over lunch, that Gospel message of faith and hope — reinforced by medical advances and a network of volunteers with whom he now works — lies at the heart of his ministry. “To the extent that we help people live life fully, the kingdom of God becomes real,” he said, reflecting that medical and pastoral care have combined to make hope more tangible.